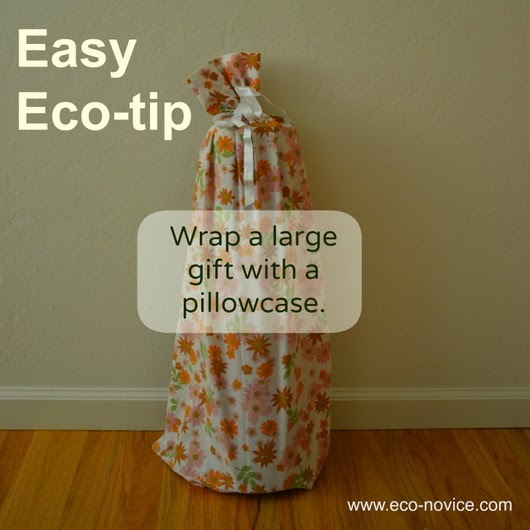 Use a pillowcase to wrap an especially large gift, rather than burn through half a roll of wrapping paper. Keep your eye out for festive, fun, and colorful pillowcases to use for gift wrap whenever you shop at the thrift store, or just use what you've already got. If you don't like the pillowcase idea, consider wrapping a large gift in a sheet or blanket (could be part of the gift) or, my personal favorite, stash the large gift in a closet or car trunk and send the recipient on a treasure hunt to find it. Pillowcases make excellent extra-large reusable gift bags (I wrapped my yoga mat for the photo above). They can be tied off at the top with a ribbon, or for flat gifts like a box you can fold the pillowcase closed and criss-cross wrap with a ribbon to hold it shut (see photos in this post to see what I mean). 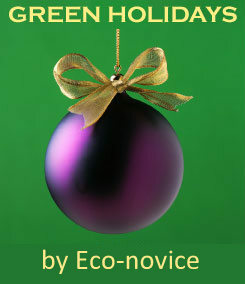 For oodles of additional eco-friendly and budget-friendly ways to wrap your gifts, check out my post Reduce, Reuse, Recycle while Wrapping Gifts. I absolutely love this idea. You could shop at thrift stores to pick up pillow cases too.